JUST 40 midnight black metallic Carbon Editions will be available to Australian customers, which means just 40 chances to own a unique, distinctive, powerful, dynamic and exclusive version of the MINI Cooper S five door hatch. Inspired by John Cooper Works, the MINI Carbon Edition debuts the John Cooper Works Aerodynamic package for the Cooper S Hatch in Australia. Finished in Midnight Black metallic paint and with Black Line trims for headlight and tail light surrounds, the menacing nature of the Carbon Edition is further enhanced by 17-inch John Cooper Works ‘Track Spoke’ light alloy wheels also finished in Black, and finished off with John Cooper Works hub caps. Befitting its name, the Carbon Edition also features carbon fibre components, including the bonnet scoop and exterior mirror caps. These are complemented by edition-specific decals to the doors (with CARBON word mark to the front doors), bonnet, roof and tail gate, as well as the John Cooper Works rear spoiler and front bumper attachments. LED headlights and LED fog lights, panorama sunroof and a sports antenna complete the Carbon Edition’s exterior aesthetic. Inside a Carbon Edition numbered badge identifies this MINI limited edition. An ownership certificate, confirming VIN and build number, is also included with the vehicle. Extensive John Cooper Works equipment sets the Carbon Edition further apart. Sports seats are trimmed in dinamica/leather, a sports chrono package (including dash-mounted instrument dials for oil pressure, boost pressure and stopwatch/lap timer), perforated leather sports steering wheel, gearshift lever with red contrast stitching and door sills all feature the John Cooper Works touch. An anthracite headliner, stainless steel sports pedals and Wired Package featuring Professional Navigation and 8.8-inch screen further highlight the Carbon Edition’s distinctive interior. A John Cooper Works tuning kit has been applied to the turbocharged 2.0-litre four-cylinder petrol engine, upping peak power and torque outputs to 155kW and 300Nm, with a sports exhaust – featuring carbon fibre exhaust tips – offering two settings, and controlled remotely via the car’s Bluetooth connection – street-legal Sport mode and a Track mode. The enhanced engine is mated to a six-speed sports automatic transmission with paddle shifters for increased control. 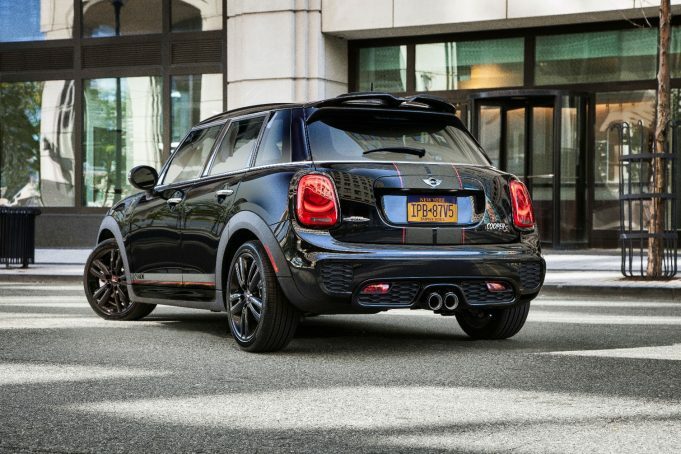 The MINI Carbon Edition is limited to 40 units nationally, priced from $56,900 drive away, and already in showrooms. It comes with a three year/unlimited kilometre warranty. FRESH styling, a new entry level model and a performance derived 150kW turbo Elantra Sport and Sport Premium edition make up the new 2019 Hyundai Elantra range, with the two sport variants replacing the SR.